Last month, Cookies Unite and Nouveau Palais hosted guest chef Aaron Langille to take over the kitchen for a night, and we have some photos to prove it! Aaron Langille, AKA Ron, AKA The Eel, AKA le Grand Slack is a complicated fellow. A wiry boy, the ultimate kitchen nerd and like most cooks, a masochist. Our tall and lanky has been planning for this November event since the birth of Cookies Unite. 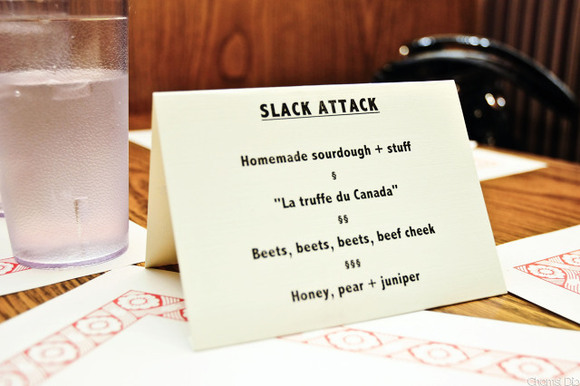 _For work, Slack has made his rounds in MTL: Le Club Chasse et Pêche, XO, Trois Petits Bouchons. Having foregone school, he decided to stage instead. Olive et Gourmando, Les Chocolats de Chloe, DNA; all well regarded Montreal establishments. All photos by Chamsi Dib. Mmm. Thanks for sharing, guys!